So on Saturday 13th August 2011, after a fairly uneventful, but 6 hour long, drive up to Drigg (a small village near Ravensglass, Cumbria, we arrived at our campsite in the Lake District. Shepherds View (link) seemed ideal for us - clean, not too big and not too busy! So we set up the tents (in the drizzle) and started to plan the next 4 days of walking and camping. Now the plan was to set off on Sunday morning for a 2 day walk from Dalegarth station to Silecroft station some 30 miles away - via Harter fell and with a night of Wild Camping in the middle. It was something I'd been looking forward to for ages since reading the trip write up in an edition of Trail magazine and the thought of a night of Wild Camping in my new Marmot Grid tent was like being 7 years old again on Christmas Eve! However, Sunday morning dawned and things started to go wrong from the outset - its probably easiest to list them and you will be able to imagine the promise of the 2 day walk slipping away the further down the list you get! 1 - packing was taking us ages in the morning and my 50Ltr rucksack had to be relegated in favour of my 70Ltr Osprey! 2 - I forgot to "lock" the valve on my Camelbak which resulted in a soaked rucksack and contents! 4 - unhelpful staff at the Ravensglass station resulting in us "abandoning" the car in a separate car pack unpaid for! So after this catalog of errors we took the executive decision to walk back to the station at Dalegarth and get back on "Ratty" and head back to Ravensglass and back to camp to dry off and sulk - the realization that none of us would be in any state of mind to enjoy the night of wild camping after walking for 8 hours as we were. So it was back at camp, in the tent with a beer listening to the rain pattering over the canvas, that we decided to have a crack at Sca Fell (not to be confused with the commonly walked/climbed Scafell Pike). At 964m above sea level it is only 14m lower than Scafell Pike (standing at 978) and, according to the books and magazines, much more lonely and rugged than Scafell Pike which is the popular 2nd stage on the 3 Peaks Challenge. 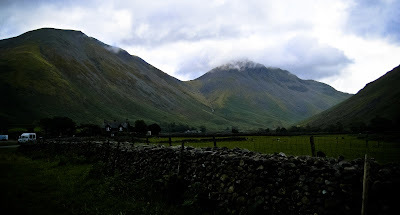 At the car just above Wast Water and below Wasdale Head we stood, in the drizzle, looking up at Lingmell and behind it, with her head firmly in the clouds, was Sca Fell and Scafell Pike. We set off, with bags packed much more efficiently and sensibly this time, up the track past Wasdale Head Hall Farm and towards Burnmoor Tarn. From there we left the bridleway and headed up the footpath to the left of Hardrigg Gill that curves upwards onto the rocky summit of Sca Fell. By this point the rain had come in and we were, at 960m, firmly in the cloud - the Mountain Equipment Firefox jacket was performing admirably and I can vouch for the breathability of GoreTex's Active Shell, worth every penny. Point 1 - this is the steep, rocky descent towards Foxes Tarn which in the dry would be fine but in the rain and mist is not a hugely pleasant experience! Point 2 - after climbing down towards Foxes Tarn and then back up past Broad Stand to almost the summit of Scafell Pike you head down another very steep section (that today was pretty much a waterfall!) that leads you down towards Hollow Stone and the joining of the "main" Scafell Pike route. It was at point 2 that we started to see people - a novel experience after 3 hours of seeing no one on the long walk in from the car and walk up the grassy flanks of Sca Fell. Once back on the main path there and many more people to content with although being a rainy Sunday morning we probably saw less people than we;d have encountered on a nice day and certainly far less than last months walk up Ben Nevis! 2pm - back at the car and heading for the nearby Wasdale Head Inn and a well earned pint - in the SUN!! Now the main thing to come out of this weekend for me was the realisation that my Mountain Hardwear Argon jacket (GoreTex Pro Shell) was/is pretty much useless in the rain - not really what you expect from a £300 jacket or what you want when heading back to the Lake District the following weekend for more walking.... So its off to Pegglers in Arundel to see what they have in stock! !